Hot cross buns are one of my must have Easter recipes. Once you try making this hot cross buns recipe, I think you will be hooked on how much more delicious they are than the store bought version. They do take a bit of time and work, but oh, how fantastic. A warm hot cross bun with butter just can’t be beat. In a large mixing bowl, soak the yeast with 1 teaspoon of sugar in lukewarm water for 10 minutes. Scald the milk (see directions below the recipe). 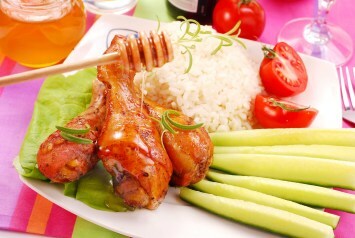 Remove from the heat and add 1/2 cup sugar, salt and butter and stir to dissolve. Cool to lukewarm. Sift 2 cups of flour together with the cinnamon, cloves and nutmeg. Add the cooled milk mixture to the yeast mixture. Add sifted flour and spice mixture and the whole egg, then beat together well. Add the raisins and 1 1/2 cups flour (reserve remaining half cup for kneading the bread later). Beat and mix, scraping down the bowl. Put a bit of oil in a bowl and coat the inside of the bowl with the oil, using your hands. Place the dough in the bowl and use your oily hands to oil the top of the dough. Cover with a towel and let the dough rise for 1 to 1 1/2 hours at a warm room temperature. Punch down the dough on kneading board or counter top. Cut the dough into 20 pieces and shape into buns. Place the buns on buttered cookie sheets and let them rise again for 1 to 1 1/2 hours. Mix the flour and water into a paste. Place the paste into a piping bag or make your own by placing the mixture into a sealable plastic storage bag. Cut of a tiny bit of the end. Squeeze the flour paste out of the cut end on to the buns to make the cross. Bake in a preheated oven for about 18 minutes or until the buns are golden brown and hollow sounding when you tap them. Pour the glaze (recipe below) over the buns while they are still fairly hot. Makes 20 hot cross buns. Combine the glaze ingredients. 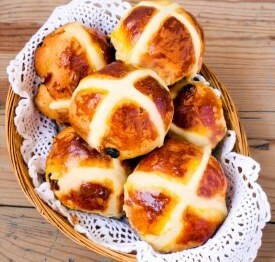 Let the hot cross buns cool just slightly then drizzle the glaze over the hot buns into the cross markings. Place milk in a saucepan and heat until just before it boils. When you begin to see tiny bubbles around the edges of the milk, but it hasn’t begun to boil yet, it is scalded. Make sure the milk doesn’t boil. The glaze method mentioned above makes a cross that you can see, but it isn’t as distinctive as if you use the flour paste method of making the cross shown below. Use either method. 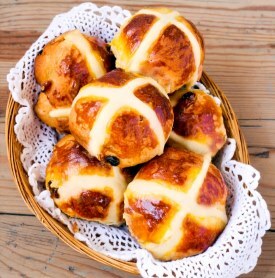 If you like a very distinctive cross on your hot cross buns, try the flour paste crosses. Then just pour the glaze over the whole buns when they are hot. If you don’t want to use the flour paste, just put the glaze on the cross part of the buns. The cross can be made in either of two ways. You can make a flour paste, pipe it on to the unbaked buns and bake it on. The flour paste will turn out whiter than the browned buns and will look like traditional store bought hot cross buns. Alternatively you can bake the buns plain, then mix the icing recipe below and pipe it in the shape of a cross on the hot buns after they have been glazed. Either way is fine. It’s really just a matter of what you prefer in looks, sugar content and taste. Mix all of the ingredients together and pipe into a cross shape on the glazed hot cross buns after they have cooled. So many baking recipes call for sifting and if you are a more novice baker you may not know what that means or why it is important. Baking is really more of a science than cooking. Exact measurements and directions are more important. When flour sits, it compacts somewhat. If you pour the flour through a sifter before you bake with it, your end result will be lighter and fluffier than the more dense non-sifted results. Sifters aren’t expensive and can be purchased at any store where you can buy baking pans and utensils. It really is worth the extra few seconds it takes to sift the flour, especially when making cakes and breads. You will end up with much more successful baked goods. I even sift whole wheat flour when making muffins. The recipes don’t call for it, but I find I end up with a much lighter muffin. For more Easter recipe ideas as good as these hot cross buns, look here. If you like this recipe, I would really appreciate it if you would take a moment to Pin it to Pinterest, Tweet about it, Like it on Facebook and leave a comment below. Thanks a lot.